Guess who's back? Back again? Murphy's back, tell a friend. Alright, enough with that nonsense! I am back again, though, to finish up the Apocalypse Mission Special Rules! You can follow me on Twitter (@BenMurphy) to get instant notification on new articles and other gaming nonsense. 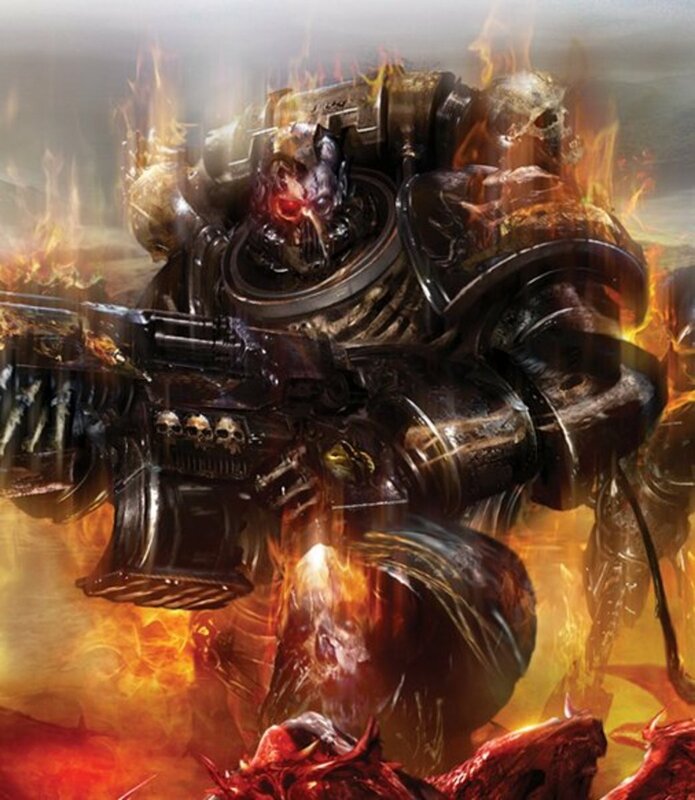 In my last few articles, I've reviewed the new rules for Divine Intervention, Finest Hour, and Sons of the Primarch. 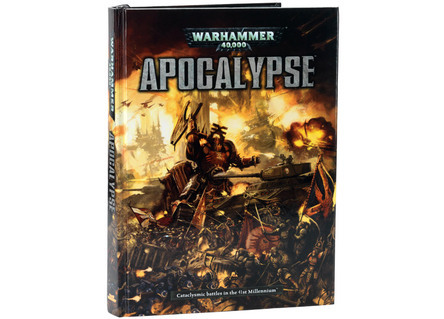 Of course, I've also written a review and overview of the Apocalypse Rulebook itself. All of these can be found at the links below. Otherwise, skip ahead to read all about Strategic Assets and how they are used in games of Apocalypse. Anyone familiar with the old Apocalypse rules will be familiar with how Strategic Assets work. There are of course some subtle changes to the assets themselves to bring them in line with 6th edition statistics and rules, and there are undoubtedly some new ones there. I want to first give a run down about something first: Strategic Objectives. Strategic Objectives are what you are fighting over. There are typically six Strategic Objectives placed on the battlefield before a game of Apocalypse begins and most missions have you fighting over control of these objectives. However, unlike a typical game of 40k, it's not just the last turn of the game that counts. Your side actually gains Strategic Victory Points after every "break" for holding Strategic Objectives and again at the end of the game. 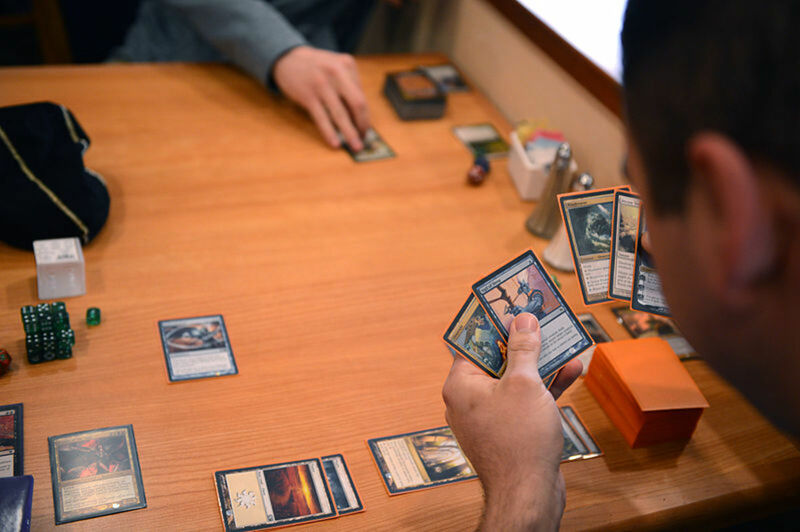 A break is any scheduled interruption of the battle, typically every 3-4 hours, when players might eat lunch, dinner, or stop to plan strategy. Your side gains 1 Strategic Victory Point for every Strategic Objective you hold, multiplied by what break you are at. For instance, during break 2, every Strategic Objective your side holds is worth 2 VPs. The reason I mention this here is that Strategic Victory Points are also expendable resources. Yes, they are totaled up at the end of the game to see who is the victor, but they also can be spent in-game (which reduces your total for the end). You can spend VPs on certain Strategic Assets that have powerful in-game effects, effects that are much more powerful than even the already impressive standard Assets. These Strategic Assets are grouped in the book like small cards and GW has given the book owner permission to photocopy those pages to cut out and distribute. So how does it all work? Each side gets a number of cards equal to the greatest number of players on either side. So if the teams are split 4 versus 3, both sides get 4 Strategic Asset cards. On the side with fewer players, the Warmaster gets to pick any extra cards. Now, each player gets to pick one of the cards for his team (or the Warmaster might pick extra). These are not blind pulls. The player can look through the list of Assets and choose any he likes. Each side has their own deck, so you are only limited by what your other team members have already chosen. Once all the Strategic Assets are picked, the Warmaster for each side can either let each player hold on to their card, or may gather all the cards and give them out to players as he dictates during the battle. However, once a card has been assigned to a player, it is up to him or her when to play it. The Warmaster only has so much control! So what are in the cards?! So what are your choices and how can they affect the battle? First, there are several cards that are available to any army, things like camouflage, minefields, and Orbital Strikes. 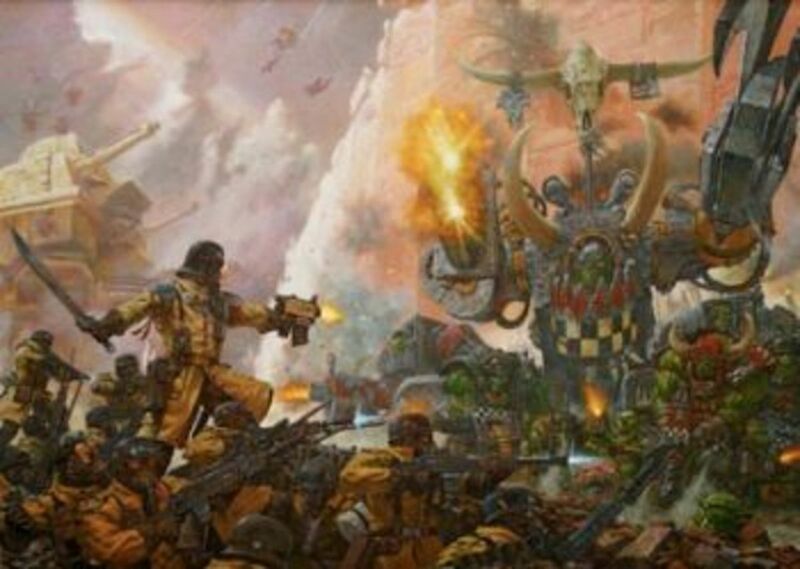 However, each army in the 40k universe has a set of unique Assets that can only be chosen by a player of that army. There are too many assets to go through one by one, so I'm going to pick out one from each race to give you an idea of what's there. Orbital Strike - costs 1 Strategic Resource (VP) - Use during your Shooting Phase. It uses the 15" blast marker with three rings. The inner ring has the Destroyer strength and is AP 1, the middle ring is Strength 7 AP 3, and the outer ring is Strength 4 AP-. On My Coordinates! - Use instead of a model firing Overwatch - Range 12" Str 8 AP 3 Ordnance d6 using the Apocalyptic Barrage. Vortex Grenade - Strategic Resource (1 VP) - 12" Strength "Destroyer" AP 1 - the blast marker stays in play and scatters every turn! Corrupt and Despoil - Use this during a break. After receiving VP's for a Strategic Objective, remove the objective from the game permanently. 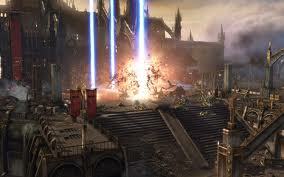 Lies of Tzeentch - Strategic Resource (1 VP) - Use at the start of the enemy Shooting Phase. Pick an enemy unit within 24" of a Herald of Tzeentch. You can choose the target for that enemy unit and which weapons it fires, and yes this can be against its own side! Idol of Gork - Use this card during deployment and place an Idol in your deployment zone. Ork infantry within 24" have the Rage rule. Phantasm - Use at the beginning of the game. All Eldar units have the Shrouded rule for the first turn. Webway Assault - Use right after deployment. Place three webway markers anywhere on the table. Dark Eldar units from Strategic Reserves may now enter the board at these markers instead of a table edge. Surrounded! - Use this asset before deployment. 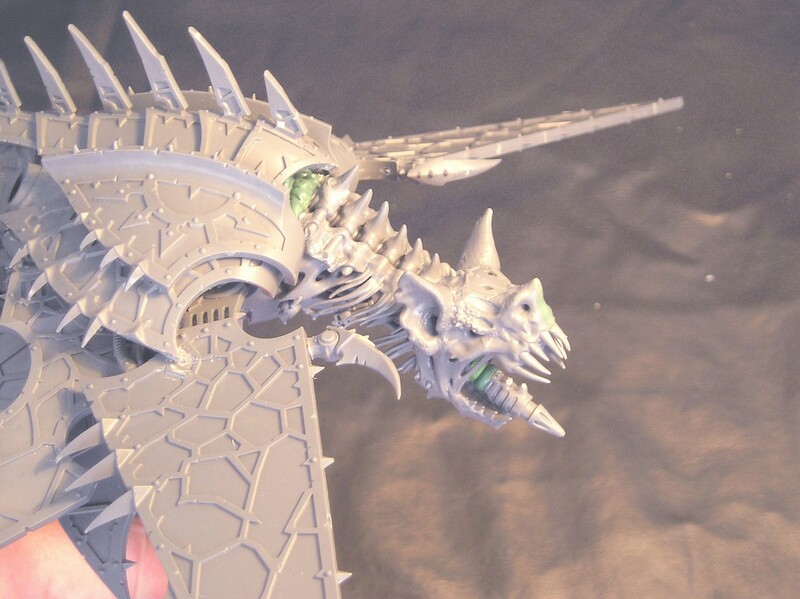 ALL Tyranid models have the Infiltrate rule for the battle. Entropic Plague - Use at the start of your Shooting Phase. 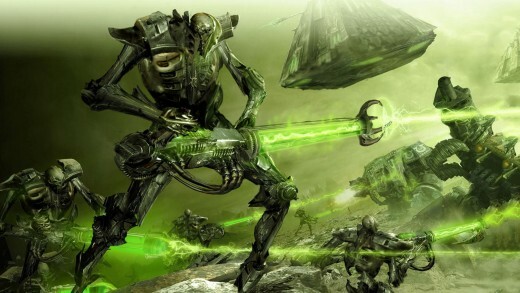 All enemy non-vehicle models within 3d6" of a Necron Warlord lose their Armor Save for the rest of the battle. Yes! Drone Network - Use at the start of your Shooting Phase. All enemy models within 24" of a Tau drone count as having 1 extra Markerlight counter on them for that Shooting Phase. It should be noted that once a card is played, it is removed from the player's hand and can't be used again. Of course, depending on the card, its effects might last throughout the game, depending on the description. In a game of Apocalypse, battlefield generals command much greater resources than the swirling firefights of a standard 40k battle. On that note, Reserves are more reliable in Apocalypse. Every Apocalypse battle uses the Strategic Reserves rule, which replaces the standard way Reserves work in 40k. The availability of a unit or formation depends on its type, with faster units becoming available first. Available to enter the board on any turn, including the first. Available any turn from turn 2 onward. Available after any break (usually 3-4 hours between breaks). Just because a unit is available on turn 1 or 2 does not mean it must arrive on that turn. There is no reason that you couldn't Deep Strike a terminator unit on Turn 3 or later. This makes Strategic Reserves much more reliable, but also more strategic as you decide exactly when they arrive. A note about entering after a break. You may still decided to keep units in Strategic Reserve after the first break. You can wait until the second break or third break to bring units in. It's all up to you! It wouldn't really be the Apocalypse if the world wasn't ending. Seriously, these set of rules are optional and the simulate battles taking place during a world-spanning catastrophe. The ground may literally shake apart beneath your troops' feet. Fire may rain down from the sky. The dead may rise. There are six Unnatural Disaster tables that an Apocalypse organizer can decide to use during a battle. These should be carefully considered because they have far reaching effects on the game and definitely serve both as a narrative escalation of tension and a new challenge to overcome as players. Each Unnatural Disaster has three levels, progressing from bad to terrible. There is a little bit of chance involved, so you will never know exactly what turn the world will start falling apart. Some of the rules require a Master of Disaster to take control of any damage effects for that turn, and this player is randomly selected at the beginning of each turn. Usually damage effects go back and forth, with the Master of Disaster's side having a slight advantage due to any odd-number of effects. So let's take a look at the tables. Mark a line across the table, with some scattering of the end points. Units within 24" of the warp breach must use their lowest leadership value for Morale and Pinning checks. Also, also pskyers gain 2 extra warp charges. d3 Chaos Daemon units arrive, each with 2d6 models, controlled by the Master of Disaster. They may charge the turn they arrive. These units must be chosen from the Troops, Elite, or Fast Attack. d3 Chaos Daemon models arrive, controlled by the Master of Disaster, and must be chosen from the HQ or Heavy Support options. d3 units are hit by Rain of Lava, taking d6 Str 7 AP 3 hits. The Master of Disaster selects the first unit, then the opposing team, back and forth. d6 Flaming Boulders hit units, chosen first by the Master of Disaster and then by the other side, back and forth. 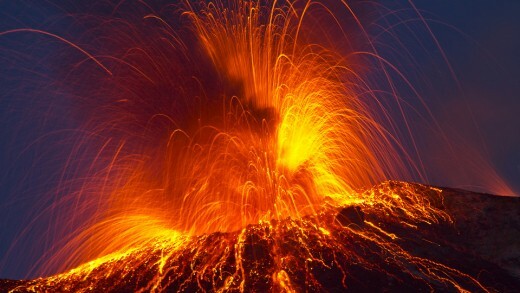 Each flaming boulder is Str 10 AP 2, Large Blast, scattering 2d6. All Armor Saves, for both sides across the entire battlefield, are worsened by 1. In other words, 3+ saves become 4+ saves. This lasts for the game turn, until the Magma Storm result is rolled again (which is more and more likely every turn). Also, every weapon on the battlefield now Gets Hot! All non-vehicle, non-pskyer units in the game now have the special rule Brotherhood of Pskyers and the Smite psychic power! For the rest of the game, ALL d6 results of a 1 must be re-rolled, even 1's from 2d6, 3d6, etc. Wow! A large blast marker is placed by the Master of Disaster and it scatters 2d6". It remains in play and scatters every turn. Note that every time this result is rolled at the beginning of a turn, another blast marker is placed on the table. Any non-vehicle model touched by the marker as it moves is instantly removed from play with no saves allowed. Also, every model within 6" of the blast marker has Fearless, Hatred, and Rage. Two edges of a board section are chosen by the Master of Disaster. These are now dangerous terrain for the rest of the turn. The Master of Disaster for that turn picks d3+1 buildings or fortifications, and rolls on the Building Damage table with a +2 to the roll. Randomly select one of the modular board sections (2' x 2' square). This board section collapses and sinks into an abyssal crevasse. Any models even touching the board section are immediately removed from play with no saves of any kind and the entire board section is now impassible terrain for the rest of the battle. Zombie Apocalypse - yes, really! Whenever a non-Daemon model dies (because of a failed saving throw), the Master of Disaster places a zombie miniature within 6" of the dead model. Form a unit of zombies if possible. These zombies have all the same stats that their living counter parts had, except that they have WS 1, 1 Wound, and no Armor Save. They may not Shoot or Run and they have the Fearless, Feel No Pain, and Slow & Purposeful rules. They are under the control of the Master of Disaster for that turn, are enemies to ALL units from both sides, and they may also charge on the turn that they arrive. Roll 5d6. The Master of Disaster places a unit of that many zombies anywhere on the board 6" from another model. All other rules from above still apply. The Master of Disaster may pick any infantry unit that was destroyed earlier in the battle and deploy them via Deep Strike. These models are not "neutral zombies" but are rather a normal unit under their original player's control. However, the unit is returned to full strength, has its full stats, and also has the bonus of Slow & Purposeful, Fearless, and Feel No Pain. D3 Orbital Strikes are triggered, starting with the Master of Disaster and alternating to the other side, back and forth. See the Orbital Strike Strategic Resource I posted above and these strikes do not cost any VPs. Virus Bombs! Every non-vehicle unit on the battlefield takes Str 3 AP - hits, equal to the number of models in the unit. Every unit on the battlefield takes Str 10 AP 2 hits equal to the number of model in the unit . . . as the atmosphere ignites! As you can see, these are some game changing events and, since they are random and rolled for every round, you are never quite sure what and when the worst effects are going to happen. One things that is sure, though, is that the worst effects increase in probability every round, so it will get worse and worse as the game proceeds. These definitely add a narrative element to the game, but beware of angering your players when their Reaver Titan suddenly disappears into a giant hole in the ground! Make sure everyone is on the same page and willing to accept the results in the name of fun! Which of these Mission Special Rules has you most excited? There we have it. 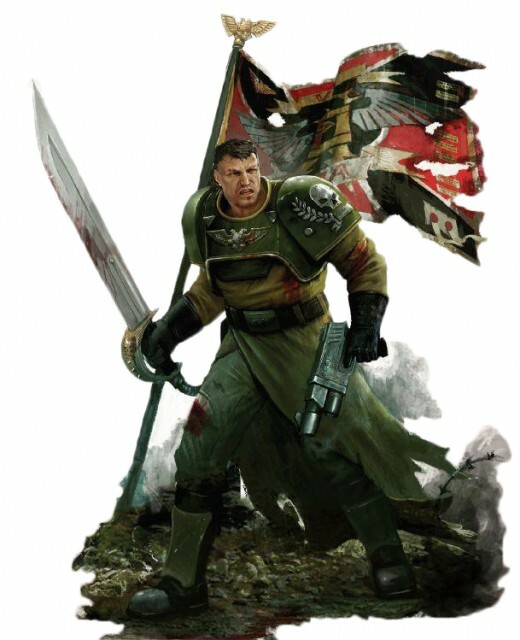 In the last three articles, I've covered all of the new Mission Special Rules for games of Apocalypse 40k. I hope that these rules have got you as enthusiastic as I am for an Apocalypse battle. I absolutely love the Strategic Reserve rule because the standard Reserve rules for 40k are so random and annoying. My Heldrake almost never arrives before turn 4, despite just needing a darn 3+ to come in! I actually want to play a game with the Unnatural Disasters table, just because I think it would add a level of craziness to the game. I'm wary of putting undo stress on other players, though, who want to win or lose based on their strategies, not a single roll of a die! Before you leave, however, why not take the poll above and then leave a comment below. I'd love to hear back from the community about what they like about Apocalypse and what they want to read about next. 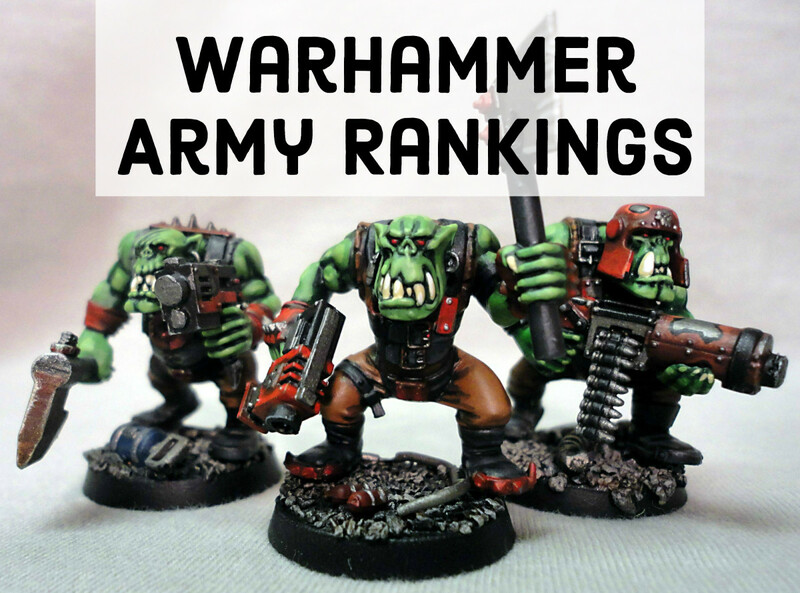 Also, check out some of my other 6th edition Warhammer 40k articles listed below. Thanks for reading. Murphy Out! ZOMBIE APOCALYPSE ALL THE WAY.